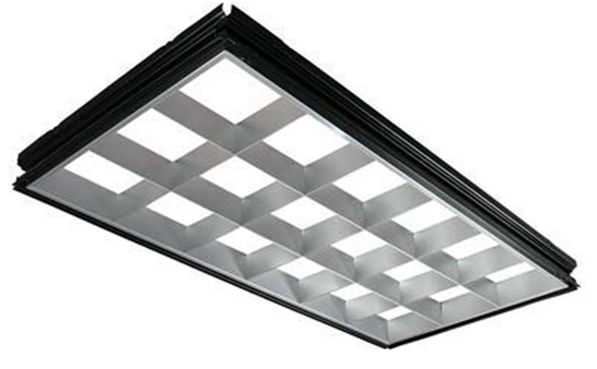 KC-PLNAB aluminum louvers are an efficient and simple alternative for replacing old, worn or inefficient lighting diffusers with a contemporary aluminum parabolic. Parabolic shaped aluminum louvers provide uniform low brightness, excellent visual control and inconspicuous appearance. This panel is formed of aluminum to precise parabolic contours. They require no rewiring or tools for installation. Once installed, it’s virtually maintenance-free. For use in medical facilities, department stores, showrooms, office task areas, banks, conference rooms, commercial and municipal buildings. DIFFUSER SPECIALIST assumes no responsibility for suitability of these materials in any luminaire or application. Please test for fit and function prior to ordering project quantities. Dimensions subject to change without notice. 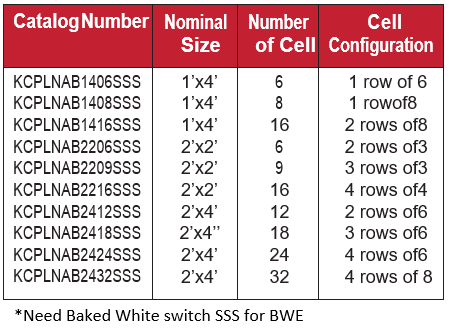 Kwik-Change®/Kwik-fit Series are designed to be installed between an existing fixture and the grid ceiling system. This will raise the fixture 2.58” up into the plenum area.